Accelerate! 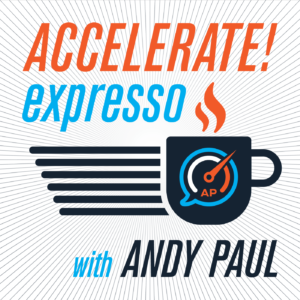 Expresso is a weekly round-up show that contains highlights from each conversation from the previous week’s slate of guests on Accelerate! These snippets have been edited into a tight, short show that will give you a taste of the insights you missed if you didn’t catch every episode of Accelerate! last week. In this episode, you’ll hear excerpts from my conversations with my guests during the week of July 10 – July 15. That’s episodes 505-510. Listen in as I was joined by the following experts: Scott Ingram, Joe Gianni, Mitch Morando and Dan Negroni. As always, Bridget Gleason was my partner on Front Line Friday. Take a quick listen now. Then go back and listen to an entire episode with your favorite guest.